The folks over at http://www.iheartubuntu.com recently put up a challenge to the Linux community to get Netflix to work natively under our beloved OS. Thankfully, Erich Hoover stepped up to the challenge and patched the Wine Project in a way to allow Firefox/Silverlight to be installed and actually work with Netflix's DRM'd Silverlight! The process is a little complex, and it involves patching source code before compiling, but Erich plans to create a PPA with all the compiling already done. Eventually, he intends to create a standalone Netflix-playing app that incorporates all the pieces of Wine and Silverlight. Thankfully, Erich didn't wait until the project was complete before sharing his success. 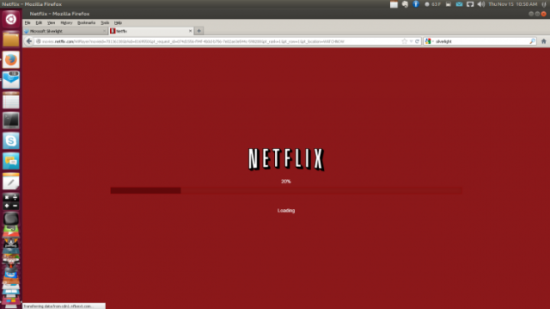 If you want to play native(ish) Netflix on your Linux desktop without virtualization, check out his instructions at: http://www.iheartubuntu.com/2012/11/netflix-on-ubuntu-is-here.html.